I was out walking Molly today in a different neighborhood than the usual route, and as I passed a yard I got a whiff of an odor that brought back -- what? a smell I hadn't experienced in almost fifty years. It was the smell of the Hungarian refugees who lived in our attic one winter, at the time of the Hungarian Revolution. Their name was Szivos, George, Maria, and Laszlo. Whenever you'd open that attic door a strange smell, probably paprika, garlic and liquor, would drift down. One time I went upstairs and there were catfish in the bathtub. It was utterly weird to me. Laszlo was my age, and he had a lot of trouble in second grade, biting students and the teacher too. 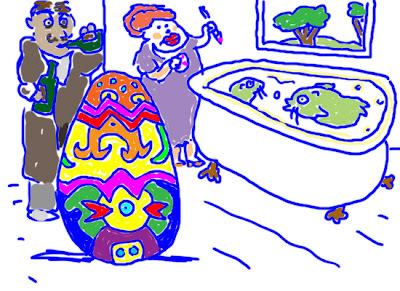 Maria painted exquisite Easter eggs and left them behind when they moved to a duplex in Summit, with other Hungarians. These eggs were incredibly beautiful- intricate folk art patterns. But she never blew them out before hand so they ended up smelling like-- rotten eggs. She seemed primitive- they were loud upstairs. She had red red hair. One last story about them. There was a ceramic portrait of me that was done by an art teacher who had stayed with us around this time. But it was never fired. My mother kept it on a back bookshelf. Years passed. My father died. I was in college. My mother came in the house one day (a house that was never locked) and there was a young man with a ski cap standing by her desk, looking at the sculpture. When he saw her he ran out. Nothing was stolen. She always thought that was Laszlo. 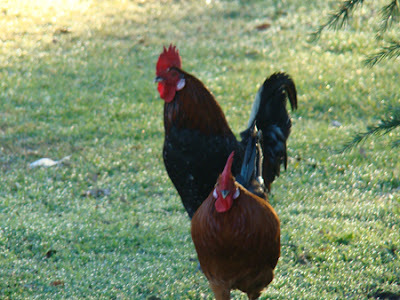 Here are my rooster buds running to meet me at dawn. The second one's behind the tree and hasn't caught up yet, but he's on his way. Tasty chicken mash! Then they tried to follow me around the lake. I had to run to lose them! So I've become another nutty bird lady. 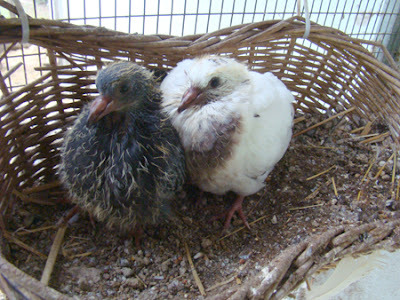 These doves are still asking to be fed but they're getting to be bigger than our chickens! 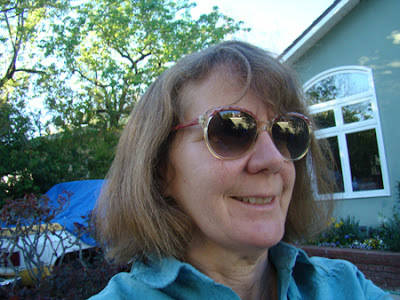 New vintage sunglasses I bought on Ebay, shipped all the way from Germany. On my trip to visit my mother I got bumped in Phoenix for a couple of hours due to weather on the East Coast. 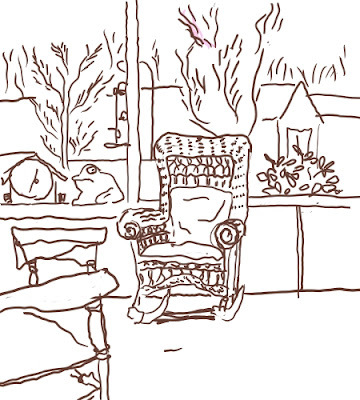 My new HP tablet laptop is small enough that I can sketch unobserved, though I actually drew this a little later on the plane, from memory. This guy was mysterious. He was wearing a long heavy brown coat with things dangling from it. His hair was white and his skin was pale: could have been albino. He looked to be in his thirties, maybe forties. The hat was the oddest thing- it looked just like the picture here. He wore knitted fingerless gloves and his sunglasses could have once belonged to Jackie Kennedy. As he walked through an aisle to find a seat, a man in his 70's recognized him and spoke to him with great respect. Who was this guy? 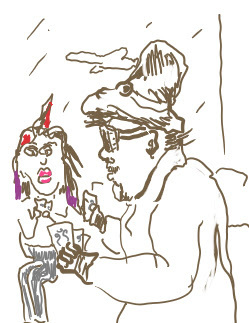 His girl friend had long dark hair with red and purple clumps going in wild directions. She was almost cross eyed. They sat down and played cards. He didn't take his gloves off. I reread "Ship of Fools" by Katherine Anne Porter, on the trip. It wasn't as good as I remembered, and so very bitter. I was once on an awful cruise to Germany a long time ago. I had a lovely visit with my mother, and got back last night. The day rushed by. My mother is about to turn 93, and she'd doing better than I guessed from recent phone conversations. I told her she needed to picture that she was pushing her walker down Tranquillity Road, and as long as she avoided certain swamp pits that set her off, she'd do just fine. (I hope the un-named relatives never see this cartoon!) These are the main four things that set her off, but they can really do their thing. I bought her a snazzy red calico cane as a back-up, in case she misplaces cane number one. 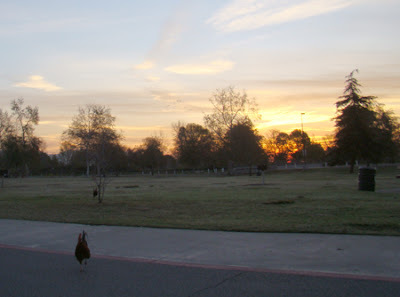 When I got back to Lake Balboa at dawn this morning, the two roosters saw me from a distance and came running. I took another direction because I wasn't ready to feed them their baggy of chicken mash yet. When I came back to the parking lot they were standing by my car! In fact one was trying to fly onto my hood! These roosters are exceptionally smart. They must recognize my silhouette, but the car??? I am not exaggerating about this! I also saw what at first I thought was a raccoon with two tails. I stopped and stared. They were mating in the bushes. Molly didn't see them. When you leave the sidewalk at Lake Balboa it is a pretty wild world! Jon met me at the airport with Molly. Sort of. My plane got in early, so I sat down outside Southwest to wait for him. After 45 minutes I was getting in a panic, because we're both very punctual people, and neither of us has a cel phone. Just then I saw Molly and him coming towards me- he hadn't seen me yet. He'd been sitting on a bench 100 feet away, obscured by a giant column. We were both big dopes. He'd been there 45 minutes too! 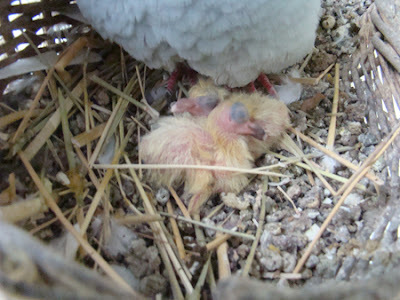 Look at the weird coloration coming in on our dove babies. 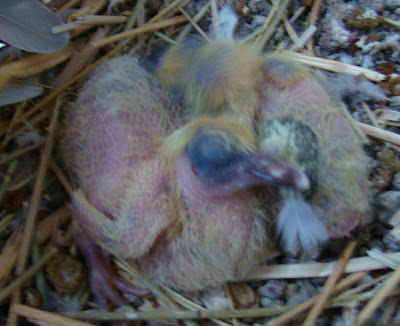 The white one has this brown red across the front. 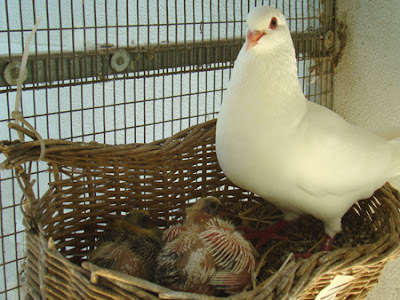 There's a fancy dove people pay tons of money for called a bleeding heart, and this dove looks like a low rent version of one. When I went out to put the chickens away just now, they were up tight against the wall in the bushes. I could pick them up like bowling balls rather than chase them all around the yard like I usually do. Then I looked up at the sky and a hawk was sitting on the wire, just waiting its chance. Tomorrow I go to New Jersey to visit my mother again. I'll take my laptop along and maybe post from Meford, NJ. 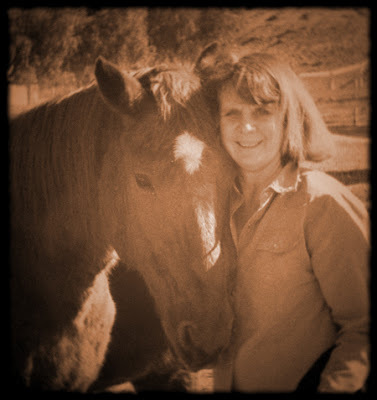 We stopped by to see my old horse Pepper on Monday, on our way back from the elephant seals. Look who moved in to the next paddock! A one day old colt and his mama. 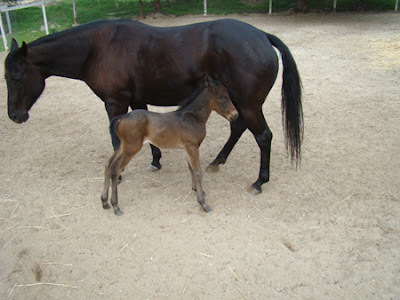 The mare's owner said Pepper stayed at the fence, transfixed and excited, all through the birth. I used a Photoshop action for that first shot. 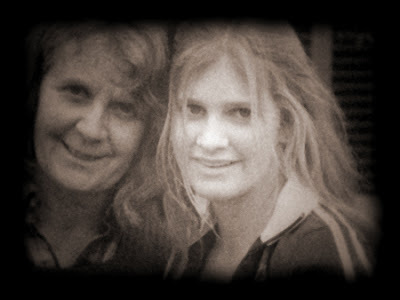 Here's another one of Dinah and me, right before she drove back to college- can you tell how sad I was feeling? She called last night while waiting for the vet. Her old goat Margarethe had lost her horn, but it wasn't as serious as it sounds, though it had me worried for awhile. The goat was actually de-horned as a baby, (not by us, it's a cruel procedure), and this horn that fell off was hollow inside. The goats are nine years old now. I guess she'll bring them home this summer. I've always been fond of the goats even though they're forever mean. On the spur of the moment we drove up to Cambria on Sunday to see the elephant seals. It was prime season. The moms were just finishing up nursing the pups, the bulls were challenging each other, and some mating was going on too. I got so many great photos I hardly know what to do with them all. I loaded some of them to flickr. I was a bit shaky when I switched my still camera to video, but here's one good shot of the bulls challenging. These animals weigh several thousand pounds! Be sure to turn the sound on too. We stayed at the Cambria Shores Inn, facing the ocean. They welcome dogs there, and have a special gift basket for the dogs when you arrive. It's a nice place-- in the morning they hang your breakfast in a basket outside your door. 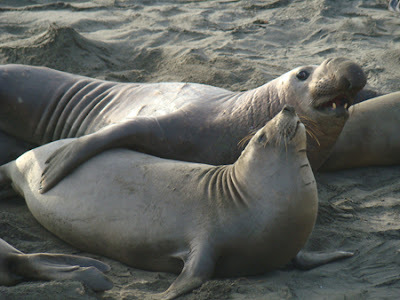 Spur of the moment we're headed up towards Cambria to see the elephant seals and their pups, back tomorrow. There won't be crowds of penguins there though- this one's in Australia. I was found in the kitchen! I could say, "guess what this is" and award an Amazon Kindle, but fortunately they still aren't in stock because I can't afford to! 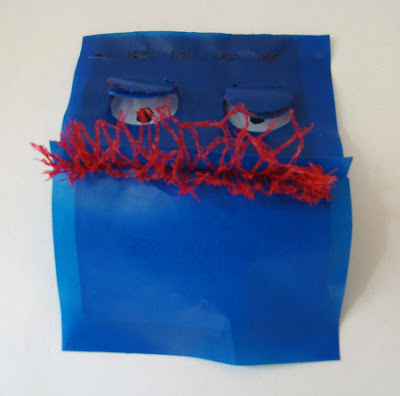 So I'll tell you- it's the end of one of Trader Joe's blood orange bags, with Sharpie eyes. The cutout eyes were already in place. It cracked me up. Hello! Thanks everybody who's looked at the new cartoon! Here's a link to the new cartoon, rendered out in Flash video. It looked better as an mov file but it's only 17mbs instead of 670! and should play as soon as you click on it. I've really enjoyed reading your comments on this cartoon, and thought I'd write a little more about it. I found the music on a google meander, liked the sound, didn't even NOTICE the title of the piece was "Sally You not Ashamed" until after I'd chosen it and I went back to see who actually did it. I was listening to a series of pieces in a category. Is that serendipity or what? It's not a loop, it's a whole recording. Since I may go back and extend sections, eventually it may play all the way through. The music gets hottest right over the end credits! As an artist I suffer from "horror vacuii", I think that's the term. Fear of emptiness. It works for me and against me. It means I put lots of details in and work pretty quickly to complete things, make a whole, but in Flash it's so easy to slug in pieces of animation that maybe aren't as good as they could be, but they're filling it up. Then I get used to the look and don't go back and change things. Whereas when animation was still in its medieval pencil> cel stage everything had to be as good as it could to go through that laborious process. You didn't want to have to do any editing if possible. Now in Flash I have to force myself to go back and improve things. Whereas Namowal, who's just learning Flash, makes all her experiments look perfect. So does Linda. I try to think of them both so I don't just put the lid on the can and leave the room. Another thing different about Flash that I have to remind myself: extra screen time doesn't mean extra expense. In the cel animation days every extra cel cost extra dollars, for inking, painting, and film process. So I tried to keep everything moving along as quickly as possible. But looking at this cartoon after not working on it a few days, I started thinking that a few pauses as the two women regard one another might help to make the humor set up better. On the other hand it's intended for cel phone distribution, where attention spans are notoriously short. Here's a text link too. Yesterday's link was impossible for just about everyone except Linda Davick and Fearless Freep. 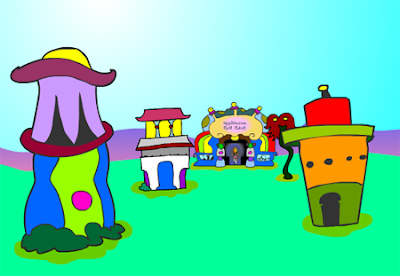 I created the cartoon in Flash, then took it into After Effects to put it all together, output it as a Quicktime movie and then despaired when it was 613 mbs. 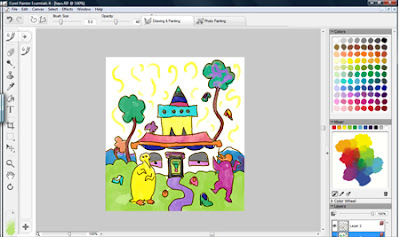 But I took it back into Flash to make a Flash video, which doesn't look as pretty, but it did the trick size wise. Although I'm one of the people who believes copyright law is just about null, please don't post this to youtube or share it too much as it might affect my chances of selling it, and I'd really like to keep this thing working. Let me know anything that you don't like or doesn't make sense. As usual it goes by awfully fast, but if you can read you can follow along! (I'll post the cartoon after lunch.) I went to the mall this week, a place I haven't been to since Dinah was in high school. I'm visiting my mother in a week, and needed to improve my wardrobe. She has thought my clothes were sad since I was about 19- really. Now that's SAD! And you can't visit her wearing blue jeans- even though her eyesight is poor, she can spot those DUNGAREES and they upset her, because she feels only people in work houses or mental institutions wear dungarees. So much for modern dress. I used to like vintage clothes, but you reach an age where people will see you in something from, say the 30s, and not know that it's vintage to you too. They'll think you're maybe wearing your high school outfit or something. 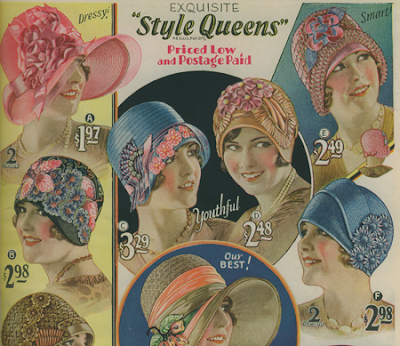 I like the styles of the 20s. I look awful in hats. While Jon's away, I haven't paid much attention to meals. But last night I got HUNGRY-FEED ME- and spotted the butternut squash. I googled some recipes, switched things around, and had a delicious soup. I'll post it here so I'll remember how I did it next time, which just might be tonight! Split a butternut squash lengthwise, scoop out the seeds, give them to the chickens. Brush both halves with melted butter, and sprinkle garlic salt too. Roast at 400 degrees flat side down for around 1/2 hour, until soft. Scoop out the insides into a pan without burning yourself. Add chicken broth-- my squash was small so I only used half a can. Add a TB or two of honey, and curry powder. Now our curry powder is rather old so I added 2 or 3 TBs. Stir it together, then dump in a blender or Cuisinart and hope it doesn't spit out the top (put a pot holder over it.) Add a little milk-- I'm sure cream would be even better, and reheat. It was most delicious, and easy. I was sorry there wasn't more. I had a crispy La Brea roll with it. I don't like the bread they sell already baked because it's like playing tug with Molly, but their frozen rolls are quite tasty. Up at 4 am and off to the computer, to turn the sound up loud and work on the sound effects for my cartoon. It's now about 2 1/2 minutes long. Jon's away so I can get these sound effects in order today. Sound effects are great fun, but hard to work on without driving the person across the room nuts. Hmm, which doorbell do I like better? It's taken me the entire day but I think I have the cartoon in a first presentation state. Only problem is, the file size is huge. So I'll have to upload it to a storage site. I'm sure I could figure a way to get the file size reasonable, but at this early stage I'd rather have people see it looking the way I designed it. 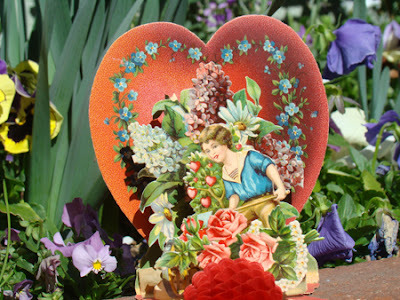 I'm going to post a link on the blog, probably on Valentine's Day, for anyone who wants to download and criticize. I can take criticism well. Then I'll probably remove that link, because I don't want this going onto youtube yet. It certainly falls into the category of "what was that? ", or maybe it doesn't. Classic example of taking criticism well: years and years ago I had an opportunity to work with Quincy Jones and Chuck Jones (no relation!) on an anti-drug rap cartoon starring Bugs Bunny. I know it sounds as if I dreamed that but it's true, and it was nuts, and came to nothing. Ultimately Warner Bros felt they couldn't trust me with Bugs Bunny. (Like I'm an offender moving next door. Love those long ears, Bugs.) But that's what they told me. I still have the storyboards. I remember Quincy explaining to me what rap was. (i actually already knew.) This was the 80s. But as to the criticism, I remember when I met Chuck Jones, who didn't want me to get the job. He'd just looked at "Quasi at the Quackadero," or maybe I had to watch it in real time with him, because he said, "Right there, at the end, it almost begins to work." Over the years, this has become a pet expression in our house. Quincy Jones was a whole other kind of trip. But as for my trip today, first thing at the lake, speaking of Chuck Jones: that darn stalkin coyote from Sunday was even worse behaved today. He chased us-- he was running after us. It was a bit scary. The exorcist voice does not work anymore. But I have one thing in reserve, which I learned from our bad goats. Make a loud spitting noise and see what you've got: a coyote in reverse. My adrenaline peaked. I warned my dog walking friends at the lake. Molly's too big to be a coyote snack but others aren't. Then I stopped to feed my buds the darling young roosters. The coots overwhelmed them when they saw I'd dumped chicken mash. I turned back to look at the rooster buds as I headed to the car, and the roosters were running after me! A day of animal attraction? I felt young again. Came home and received a series of belligerent and bold phone calls from Scientology, looking for Jon, using his nickname from before he went to college. These people were truly nasty and hard to shake off. Someone must have been p.o.ed that he didn't go to the high school reunion and filled out a postcard. I can't remember another time when I've yelled into the phone: "go to h@ll!" These cartoons do seem to tip my wagon. And some creatures get cuter every day. Unfortunately I'm not one of them. Hope that zip tie keeps the lovely basket in place. 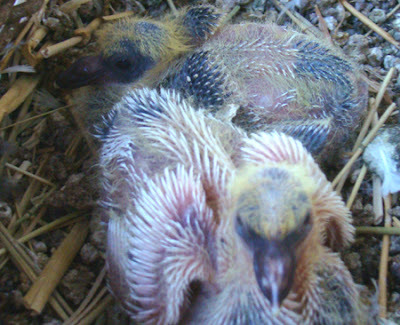 Every day they're getting closer to cute, and doesn't dad James Brown look proud? I've been allergic to bananas since I was about 26. I had to rush to the emergency room looking like Alligator Woman at that time. I've never eaten one since then. But while I was driving Jon to the airport this morning, before dawn, we heard an NPR story on bananas. And I thought, "It's a shame they can't make leather out of bananas, because it would be so soft, and yellow, and guilt free." And I imagined this being the most signifigant thought of my life, and how I'd discovered leather to make even a peta nut happy. Roosters at Lake Balboa are still fine. In fact I saw them chasing some coots. 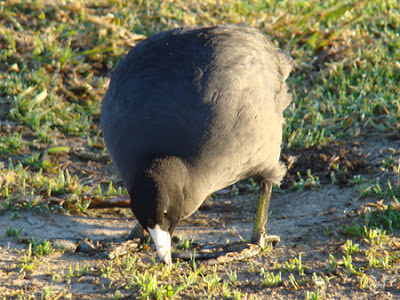 That's one of maybe 1000 or more coots at Lake Balboa, at this time of year. However, in this story I'm the old coot. Just thought you might not know what a coot looks like! I got to Lake Balboa at dawn, as usual, and walked Molly around. We played a lot of tennis ball chuckit on the field on the first lap. 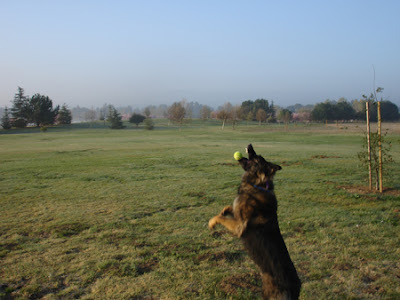 A chuckit is an amazing tennis ball launching device that works wonders for feeble throwers like me. I always have it with me at the lake. It's about two feet long, with a cup to hold the tennis ball and some kind of aerodynamic engineering so it goes really far. On the second lap, I took her out on the field and practiced some of the things we'd learned yesterday in obedience class: off leash healing, and distance downs and sits . I tried some find-its throwing food about when she was running off after the tennis ball and she liked finding them on her return. I put her on a really L O N G distance down stay and then called her. She came running right to me. As a reward I threw the chuckit tennis ball one more time. As she was running back with the ball, she suddenly stopped and looked away. She never stops on her way back with the ball. And there was a beautiful, solo, coyote staring at us, and then walking straight towards us but still at a distance. 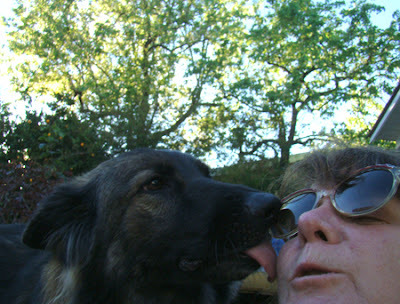 I told Molly "down-stay" as I rushed to her to get the leash on. She lay down reluctantly. The coyote was still approaching us. I waved the chuckit stick at the coyote and used my exorcist voice to scare it off. It didn't scare. It was small but it was bold. We headed towards the sidewalk. I kept looking behind me and the coyote was still approaching us. In fact it even flanked us, which was creepy. Then it seemed to change its mind, and moved off. I saw it it stick its nose in a hole and pull out and eat something wiggling, in one gulp. I thought they chewed first! 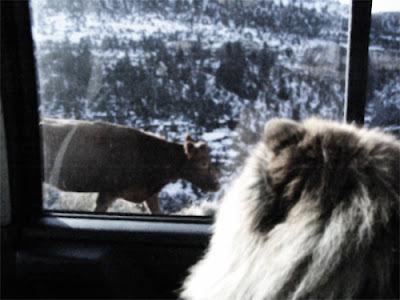 Molly was much bigger than the coyote. I could tell she knew it wasn't a dog. She wasn't flipping on her leash the way she might have if it were a loose dog. But she was wary of it, and it was a wonderful way to start the day, exciting, a little scary, a taste of the wild. Here's a link to an earlier Lake Balboa coyote encounter. That coyote was much bigger. and here's today's cute? baby picture. The reason it's blurry is baby on the left rises up to intimidate me when I approach! The combo of white feathers and black skin is extra weird. 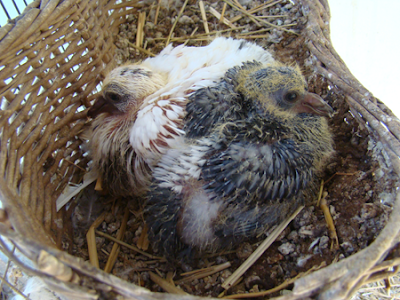 Silky chickens have black skin, but surely James Brown the giant dove hasn't mated with a chicken! They're looking more and more like bizarre flying creatures each day. They actually fluff up and make a little noise when I come too close with the camera. 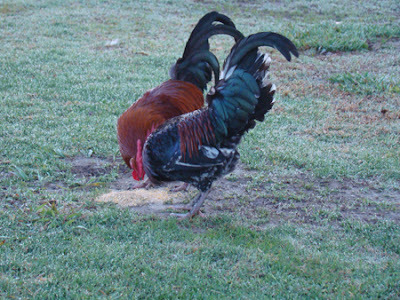 Someone abandoned these two roosters at Lake Balboa. 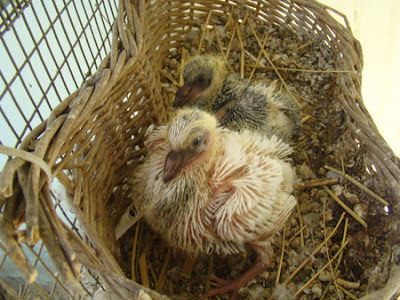 I took them chicken food the last few days. They hang together and seem very tame. I wonder if they'll be there tomorrow. With 80 degree weather the place will be packed with folks who bring big families to barbecue, and are fond of chickens. 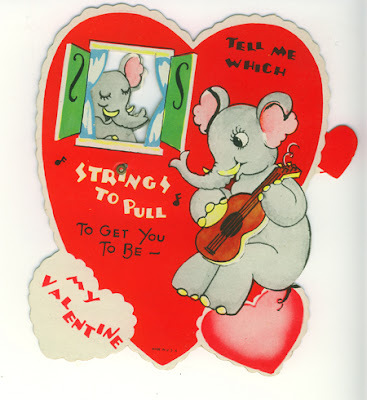 It must have been fun to design valentines like this one. Just a little mechanical. I have quite a few from a house sale my mother ran long ago. 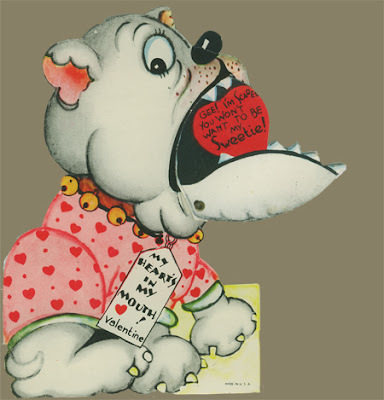 Remember the fun of opening little white valentine envelopes? And some kids gave you candy too. I have some Victorian ones that are incredibly elaborate but no fun to display because every time you open one another piece falls off. Face it- you're not cute. Mammals get the looks. You get pooped on by your parents. 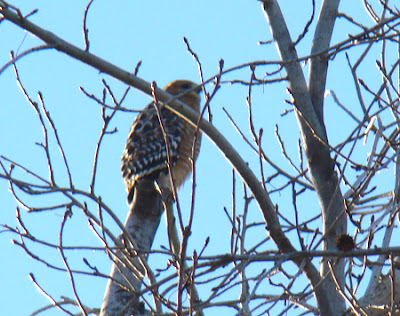 And red tailed hawks sit in the tree right above you screaming about what tasty treats you would be, but for wire. I've got my new tablet working. 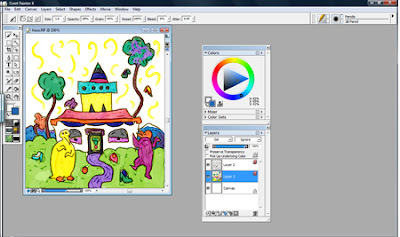 When I draw on it I use the vertical setting, but for this demonstration I wanted to show you the differences in Painter Element 4, (I call it Junior), which comes as free software with Wacom tablets and tablet laptops, and Painter X (I call it Pro) which is the professional version of the software. 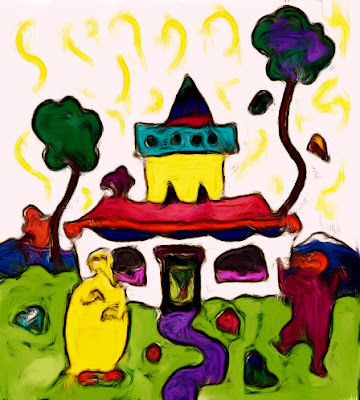 I did this sketch on my tablet. Just a silly picture of raining shoes. This is Painter Junior. When you choose a brush, a panel slides out which makes it easy to see what you want. It's rather playful, and it remembers which brush you chose in which order so it's easy to grab that brush you liked again. I like the 2B pencil and a brush called "new simple water" which the Pro doesn't seem to have. You can see how jolly all the dabs of color are. This is the interface for Pro. Doing the Photoshop thing, which is not as much fun. But it has a zillion brushes and features, and all sorts of image hoses and cloning possibilities, which I'm sure are much fun once you get a feeling for them. I quickly colored the image in on a layer below the drawing. 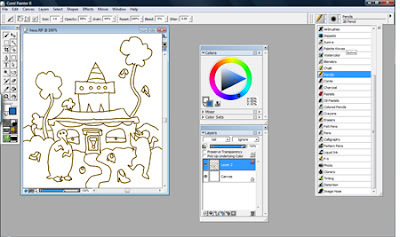 I liked the feeling of line in the drawing-- much more responsive than either Photoshop or Flash for my way of working. I hold my pen very lightly. 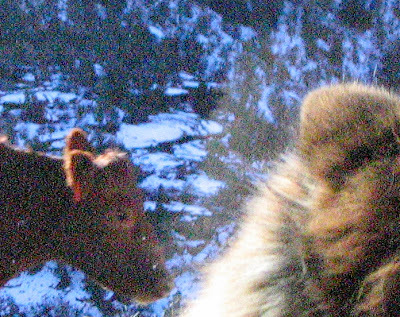 Close up of the image. That's all the art I did. I stopped there. This was just a demo. When I reopened the identical file in Pro it had taken on a woodblock texture. I have no idea why. I saved it as a jpeg, and went back to Junior for lazyman fun. Weird that the two versions would handle the same RIF file differently. 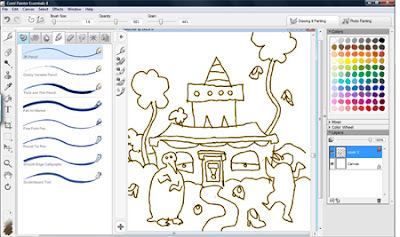 They have a variety of artist's styles that will repaint your image in real time. This one is classical oil painting. You can go in and refine it within the style chosen. It's kind of outrageous and great fun to see your nothing special sketch turned into something so expressionistic while you watch. Here's another one. I think this was called wet water color. I was tempted to shoot a video of the painting while-u-wait, but I don't have a tripod. Painter Pro also has this auto painting feature, but it's accessed more easily, for a beginner like me, in Junior. one more, kind of Jawlensky in feeling and ever so much better than the rough sketch I actually drew and painted. I've been having fun coloring in cuts from the catalog I've had a long time. 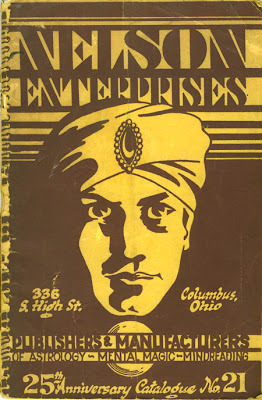 It's filled with wonderful period clip art related to magic and mind reading. 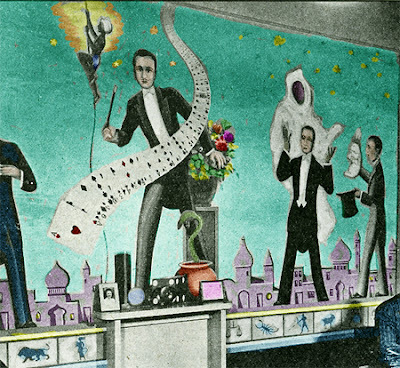 Here's a picture of the mural in the office, they say, "In this office all transactions are strictly private." Good thing. Love the drawers. 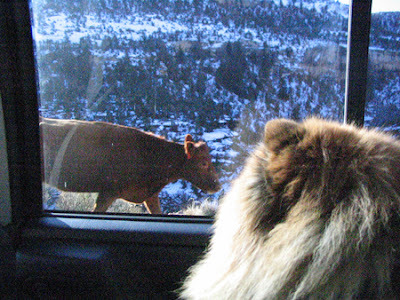 Jon saw this image of Lulu looking out at a cow as it flashed by on my screensaver, and wanted a copy of the picture. I told him it was a great photo but had some major pixel problem, maybe because it was taken long ago with an early model digital camera that stuck on the wrong setting.. So I opened it in Photoshop, tried to lose all the rainbow dots via repeated Filter>Noise>Despeckle. That took some, but left a lot of stubborn white spots. Then I desaturated it a bit, took the smudge tool and smeared the dots. I duplicated the layer, making the one below totally desaturated, and used layer "Soft light" to combine them. I like it better, do you? "Miles to Go" that's the title. That's the kind of day I had. 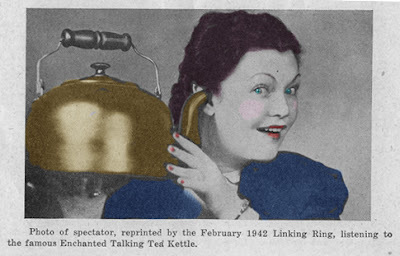 I didn't stick any kettles in my ears though. What do you think it's saying? And how did she know to listen in? So I opened the tablet today. It was still vertical. I looked up HP tech support on my hardtop computer, decided to try the phone since the chat was so impossible. First person I got after yelling answers to the calm robo-voice was a woman named "Bubbly." I said, "you mean like bubbles?" She said that was her name. She'd never heard of the name Sally before. I spelled it very slowly. I asked if she could transfer me to someone who spoke English since I couldn't really understand her. "No", she said, "I'm all alone." And she sounded all alone out there in the Indian ethernet. I disconnected, tried to think of something else to do, then gave in, hit redial. This time I got Tom, who was in some loud and lonely tech support chamber. He had a hard time spelling Sally too. After we'd been exchanging information for about ten minutes he told me I'd come to the wrong place, that he didn't know anything about my computer. But at least we had the chance to spend ten minutes together. ggrr. I had been connected to him by yelling into the phone, on command, "TABLET PC." "Thanks, you said Tablet PC, right?" You know how that goes. But Tom said he would transfer me. This time I got an Amurican, it sounded as if he was maybe located at the Hoboken train station in a phone booth and hated his job. He said he could probably help me but not until after I'd FAXED my proof of purchase. I got chuffy and he got chuffy. I settled down. He said he'd help me anyway. He directed me to the tablet settings in the control panel and explained where you change orientation from vertical to horizontal. That's all it was... and the fellow in HP chat was going to have me working away on the BIOS and reinstalling drivers. So I spent a little time working on the snazzy machine, feeling friendly towards it again. 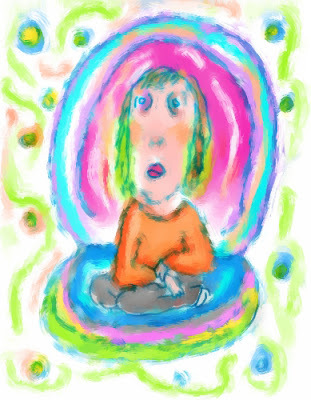 I did this drawing of myself in a clam shell, subconsciously I guess it's a tablet. Trust me I'm not sitting on a pearl. A great designer whose name you may not know died at age 101. I'd never heard of him before, but I recognized many of his designs. 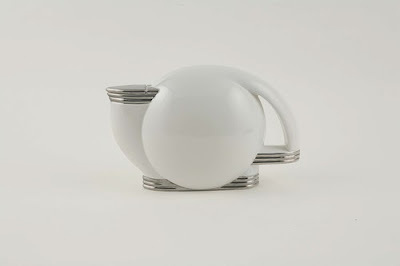 I thought this teapot was thrilling to see. Although I have to tell you, when I came back to check this post I thought it looked like a fancy toilet for squirrels. The obituary linked to above contains more amazing images of his work. And still more are here. Be sure to view all the pedal cars. Now these are nice small cars with better design than the smart car. So the phone rings at 6 am, and Jon says, "This isn't good", because there are blizzards in the state and Dinah's at Lake Tahoe. We went out last night so I'm not at Lake Balboa already. It's my mother. She's in a tizzy, and thinks she's called my brother Cricket. Jon hands me the phone and Mom's hung up. I run to my desk to call her back. She tells me she's really worried about my brother. Why, Mom? What's wrong? I think he's gone to South America and I'm really worried. I say no Mom, he's going to Africa but he hasn't left yet. (Which is potentially much more of a worry, considering the situation in Kenya.) We try to line that information up. Then she gets on the real issue. Someone's lined up all my liquor bottles like soldiers. It's either Cricket or the cleaning woman. I always have them on the shelf in twos and now they're stiff against the wall like soldiers and there's not much in them. (Not this again) I remind her that liquor evaporates. The liquor she has is from last millenium and she's never been good at screwing on tops. My brother had gone to see her mid January when she had a similar panic attack. He told me he cleaned the refrigerator, straightened the liquor bottles and threw out a lot of odd food items found in unexpected places. Her eyesight isn't good anymore, and she forgets a lot. And these liquor bottles seem to be a jag in her brain. She goes back to worrying about the liquor bottle soldiers, how strange they looked. And why he had to line them up like that. She's laughing now, but still upset. I urge her to get over it, that there's really nothing wrong. 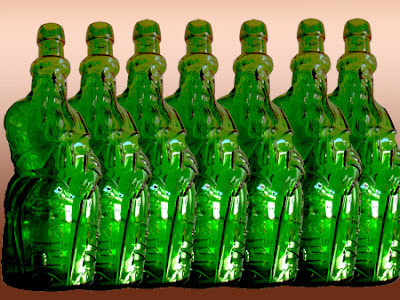 If the cleaning lady were actually slugging the booze down, other fussy residents would have noticed the drunken cleaning lady. And too many weird accusations will lead to losing the apartment and getting moved upstairs. Back in the 70's my mother conducted estate sales after my father died-- she knew a great deal about antiques. The estate sales happened when someone died, or moved to Florida, or-- I'd forgotten the third possibility: the big crack-up. One sale I remember was at a large country house near Bernardsville, NJ. There were lots of books in the den on ufos and psychic living, and the railing of the staircase leading to the den was a piano keyboard, which was lovely and odd. I don't think it played music though. But I remember hearing the reason the house was for sale was the lady had lost her marbles. She liked to call the police out on false alarms, and when they'd arrive they'd see messages painted in big letters on the walls like: "Officer Robinson is a Fat Pig". 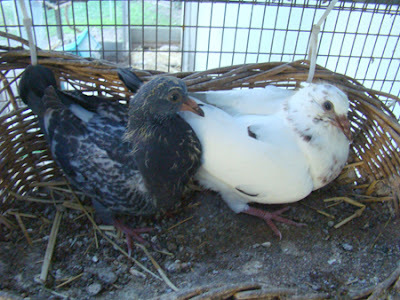 James Brown the white King Pigeon, named by Linda Davick in a contest a while ago, has been sharing custody of two eggs with his little friend the un-named pigeon. 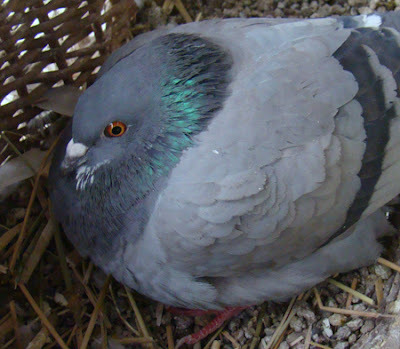 This morning when I went in to the aviary to check on things, I noticed the pigeon looked unusually fluffy. I had my camera with me because it seemed as if it should be time. And here's what I saw. 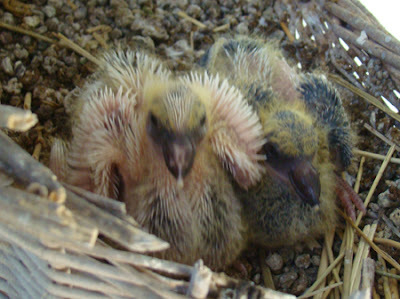 Miniature condors? They must have been born last night!